Frank und Frei is a restaurant in Sternschanze. And while the restaurant offers food and drinks from early in the morning until late at night, I want to especially recommend the breakfast. 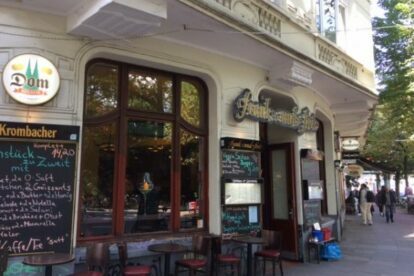 Frank und Frei offers a wonderful breakfast for two persons at a reasonable price. Breakfast includes croissants, buns, different cheeses, jam, fruit – whatever you can think of. Do you want a glass of sparkling wine with your breakfast or would you rather have a glass of orange juice? You decide. Coffee is included in the price and the lovely waiters and waitresses come around and even refill your cup for free! There is no better way to have a long and extensive weekend breakfast than at Frank und Frei. And what’s best: The restaurant offers their breakfast on weekends from 9:00 to 15:00 on the weekend! So you can even sleep in and start your Sunday slowly before heading to Sternschanze for Frank und Frei’s lovely breakfast.